In the first part of the video, I used all-lock mode, which keeps the camera pointed in the same direction all the time. In the second part of the video, I used the follow mode which will only stabilize the pitch and roll. You can control the yaw by turning the handle. I used this mode to keep the camera pointed at my kids as they exited the ride. I’ve also tested the G360 with a different kind of skateboard called Alterskate, which has two sets of freely rotating axes, so you can propel yourself by making a sidewinder type motion. I thought it would be a good test for stabilization. Here is the video, with unedited sound so you can hear it for yourself in operation (please note I was beside a car wash). TIP: when rendering the video, I had to disable vertical correction in the ActionDirector options (or else the horizon would not be level). Setting up a camera for the G360 takes a little longer than I expected. The gimbal seems to require very careful balancing. The good thing is that it has many fine-tuning adjustments for balancing your camera. In terms of performance, I think the G360 performs quite well with the Samsung Gear 360 (original version). I’ve also tested it briefly with the Nikon Keymission 360 and the Vuze Camera (with the Vuze’s width, you have to mind the handle when the handle is upside down). I’m still testing it and am checking with FeiyuTech about some technical issues balancing other cameras with the G360. Meanwhile, if you can’t wait for my full review, you can get the FeiyuTech G360 from Amazon here. I recommend the kit with the extension stick (the extension stick is quite useful). Does the Feiyu G360 Gimbal work with the Theta S? Also, you mentioned it worked with the KeyMission360. Just wondering if you think the gimbal should work with both of these cameras. Keep up the good work. The blog is a great resource! Thanks John! I can confirm the Keymission 360 does work but I’ve been having a little trouble balancing the Theta on the G360. I’ve asked Feiyu for assistance and will let you know if / when I’m able to balance it. The joystick control does panning, but I can’t make it tilt back and forth. OK, perhaps not needed with a 360 camera, but they show it can also be used with normal cameras, for which the ability to tilt would be handy. I don’t see why this cannot be done, it is balanced after all. Any chance of a firmware update? Hi Dave. Yes some people have pointed that out. I will ask them. Thank you very much. I have the same problem for control tilt with joystick . Have you a solution ? I´m wrestling over balancing an iPhone 6s plus with an insta360 nano mounted on it. Was thinking about extending the counterweight rode. What do you think? As I use it to broadcast in Periscope360 the gyro stabilization doesn´t count and putting it horizontally or use it by itself is not an option. Thanks a lot for your answer. I´m buying a Smooth Q with the hope that it can handle it (I´m even buying a 5 inch android phone to try it with the INsta360 AIR that I also have). Hi Guilleca. 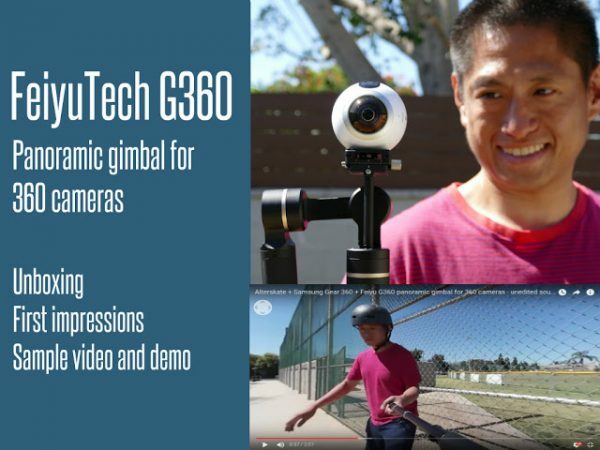 The consumer 360 gimbal with the most powerful motor is the Guru360. That has the best chance of stabilizing a top-heavy camera combination. And your idea of adding counterweights to the base of the phone may help. İ am real estate agent. Which 360 camera should I buy and software. Which camera is fast and practical panoramic. Hi Alo! It depends on your budget and how much time you have. The best quality is from a DSLR panoramic head. But since you said you want it fast, I assume DSLR is not an option for you. For an all-in-one 360 camera, the best one is the Panono but it needs to be at least 4 feet away from everything, and it costs $2000. Another option is the Xiaomi Mijia Mi Sphere which I reviewed here http://360rumors.com/2017/06/review-comparison-xiaomi-mijia-mi-sphere-highest-photo-video-quality-among-consumer-360-cameras.html Another good option if you want full control of exposure is the Ricoh Theta or Theta SC (or you can wait for the next Theta 4K). Guru Air 360 and Wearable Kit now available for preorder!